I usually have to fight with my friends and family about the amount of make-up I wear. I constantly receive unsolicited advice that “a little foundation wouldn’t kill you,” or that I should put some color on my lips and play up my eyes. Sometimes I’ll apply a smidge of eyeliner, but I‘ve always preferred the no-makeup look and often become overwhelmed at the sight of anything more than neutral gloss on my lips. I never thought I’d receive some of the best life advice while sitting at the makeup counter in Sephora. 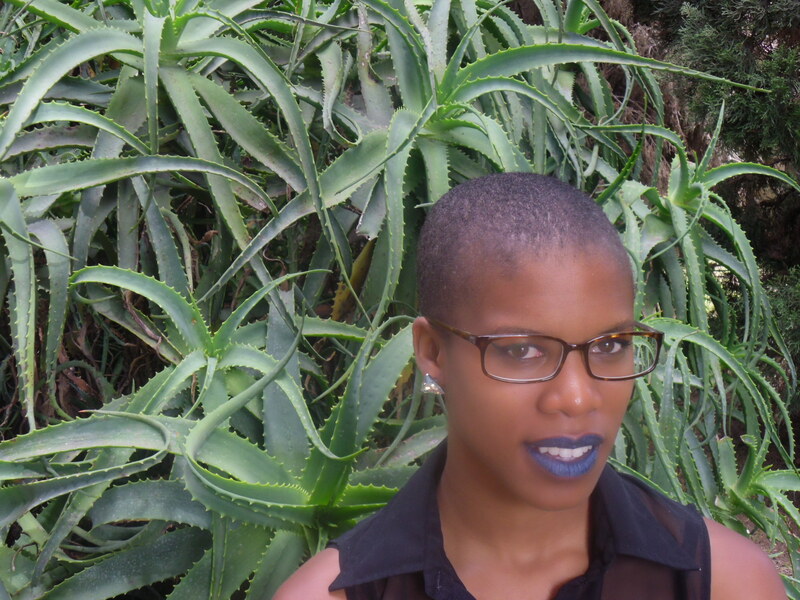 I had recently decided to upgrade my look and take more fashion risks, so there was one thing I was itching to try: blue lipstick. Yet, after visiting the popular makeup counters and a few drugstores, I couldn’t find any blue that worked with my brown complexion. At a Sephora makeup counter, I met a makeup artist who was wearing a bright purple lip color with an ombre affect. I’d previously visited another Sephora and didn’t see any blue lipstick, but I figured I’d ask this woman, since she also seemed to be into eye-catching colors. “We don’t have blue,” she told me. Just as I was about to mark the trip unsuccessful, she said, “but I can make it for you.” She made her purple color by blending cream eyeliners because the store didn’t carry the bold lip color she wanted. She said people think products must be used in the way they are marketed; however, using them in other ways can get you the results you want. I watched as she created a perfect azure blue. Maybe I was a gullible customer falling prey to this seasoned saleswoman’s pitch. However, I thought about what she said and how it directly applied to experiences I constantly run into as a young adult. 1. You don’t have to follow every social rule. I admire rebels—who doesn’t? Nothing restricts us from using eye makeup on other parts of the face. I think it’s cool when women shop in men’s stores. I appreciate when people say hello (or at least smile) in elevators. I respect women who ask men on dates. People who violate the norm teach us to be daring, try new things, and live life on our own terms. 2.Take care of inner problems first, otherwise they’ll show up in your outer world. Before applying the cream to my lips Kim applied lip balm, explaining that it would moisturize and ensure that the lines and creases in my lips wouldn’t show through the color. My lips have always been extremely dry—so lipstick would often highlight my chapped lips. Yet, applying shea butter in the morning usually takes care of that problem, making my lips healthier; otherwise, the blue color would be overshadowed by my raisin-looking lips. Of course, this doesn’t solely apply to lip color. My inner fear of getting rejected from grad school emerged as procrastination on my applications. My close friend’s self-esteem issues projects outward in her relationships with men.Sometimes the things we think we’re hiding underneath a touch of foundation and concealer shows up in everyday situations. 3. Be creative with your resources. You won’t always have exactly what you want, but you might have just enough of the right ingredient for what you are looking for. 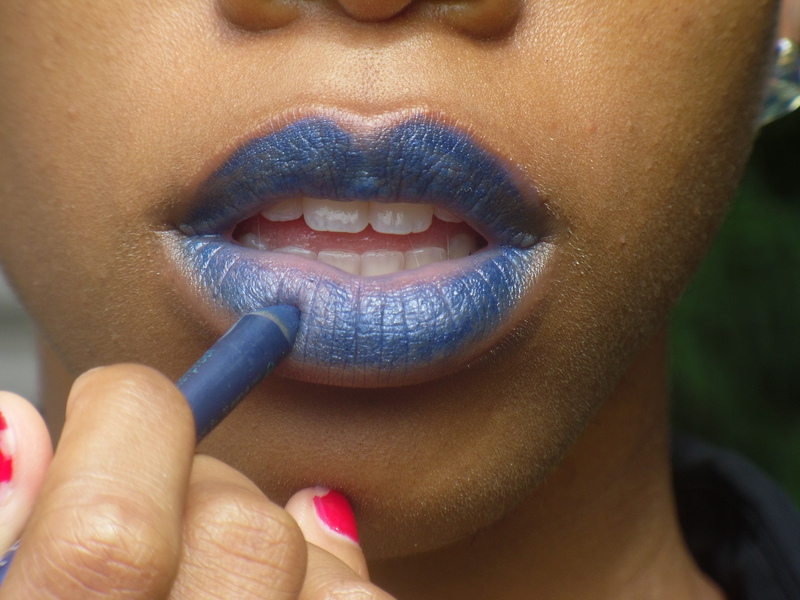 At first, Kim put this metallic blue eyeliner cream on my lips. I hated it. And it was the only blue cream they had in the store. Then Kim tried something else: she crushed a blue eyeliner color that I picked out and mixed it with lip balm. I looked at this woman as if she’d just painted the Sistine Chapel, and I couldn’t believe how innovative she was. A little creativity goes a long way. 4. The opinion that matters most is your own. There will always be tons of opposing ideas and viewpoints about the way you look. 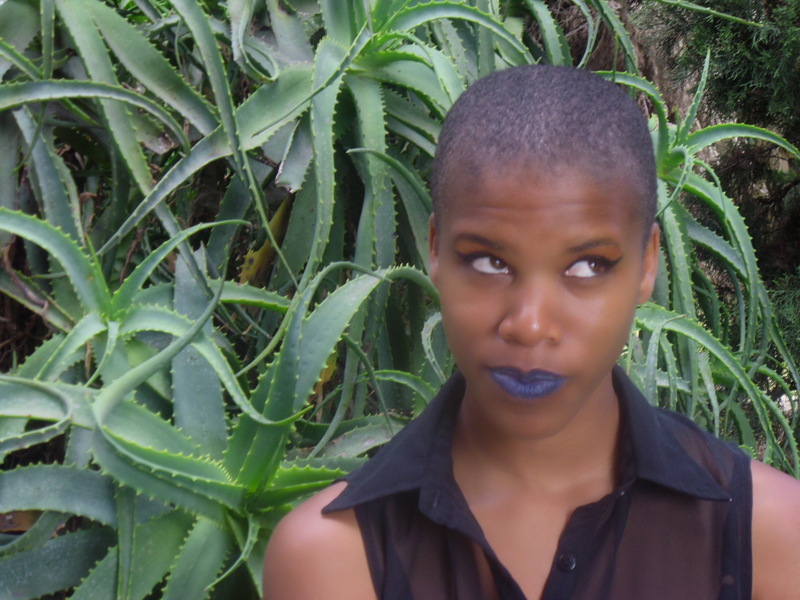 While walking through the mall in my blue lipstick, I got tons of complements and a few blank, yet intense stares. At my home away from home, my cousin and aunt loved it too. However, my immediate family was disgusted. They said it was too Goth for their tastes. They went on for 30 minutes about how much they hated it. Yet, I didn’t see what they saw. Looking in the mirror, I loved it more and more with each glance. Oh well—can’t please everybody. Mix 2 colors together. Blend a lighter and darker blue until you create a color that works best with your complexion. If you can’t find a cream that works, crush eyeliner pencil colors and blend them with a colorless lip balm. Amp up the eye makeup. I usually don’t wear very much of anything on my face, but with a bold blue color, I had to add a little eye shadow, eye liner, and mascara to complete the look. Add a pair of glasses. Wearing glasses, especially thick-rimmed glasses, with the blue color makes the look chic, like you just stepped out of the magazine. Excellent reminders. I completely understand your situation as I have never been a big makeup person. More than one friend has taken me to makeup counters, Merle Norman, etc., to get me in the proper makeup frame of mind, and all have been unsuccessful. I grew up in that very mixed period of the natural look, the “do I have enough blue eye shadow on”, and the start of the punk rock look. As I got older and entered the corporate workplace, I realized that a splash of gloss or complection complimentary lipstick goes a long way in projecting professionaliam. To this day I rarely use just one lipstick or gloss at a time and I have NEVER purchased blush or Eye shadow. As long as you have Vaseline (a few swipes with your finger across your eyelashes) and a couple glosses or lipsticks (for lips, eyelids, cheeks and between the eyes) you are good to go. That creates the look of a woman who’s face has been enhanced as opposed to made up. It seems to me that was the original intent.